Similar to the Sport Duty, this plow is lightweight enough for many half ton and SUV vehicle applications. But now it is also available in three different moldboard options. With a blade as light as 367 lbs. (7'0" Poly), this plow fits many different vehicles. You can get exactly what you want with steel, poly or stainless steel skin options without losing the recommended vehicle application. 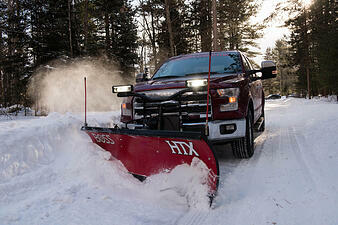 To confirm that your vehicle is recommended for HTX snowplow use you will want to visit the BOSS product selector tool. Choosing between steel, poly or stainless steel can sometimes be a difficult decision for snow plow buyers. Each material handles snow a little differently. Steel offers a durable and rigid plow with a classic look. Poly has the quality of added slickness and is less prone to dents and dings. Stainless steel also has the benefit of slickness while also being very visually appealing. The option of three different materials also gives you the option to better match plow to truck and make your snow removal set up look sharp. So, whether you want to choose a plow material based on its physical quality of handling snow, or if you want your plow to look tough and match your truck, you now have the option to choose the material you desire. All HTX blades come standard with a built in shoe bracket to make installing plow shoes much easier and faster. Pre-punched holes at the top of the snowplow blade were also made standard for quicker and easier installation of snow deflectors. By adding this shoe bracket and pre-punched snow deflector holes, it makes adding these accessories a breeze. If you ever find yourself looking at your plow and wanting to freshen it up with a new skin, it is easy to simply order a new skin and swap it out without buying whole new snow plow. This is because each of these skins is now mounted to the frame with 3/8” carriage bolt instead of 1/4” self-tapping screw. This not only adds strength and durability, but these carriage bolts are also much easier to remove which means should you ever need or want to replace your moldboard or a single bolt it is much easier to do so. If you wish to upgrade, switching from the Sport Duty to the HTX is a simple process. This is because many of the components on both plows, such as the cutting edges, hydraulics and lighting systems, are the same. All that is required to make the update is a new HTX blade and you’re ready to go! If you’re a homeowner who needs a simple, easy to use plow yet still enjoys a few extra features, a BOSS HTX straight blade snowplow may be a good option for you to consider, especially if you are already familiar with the Sport Duty.